Microsoft Build 2018 is only a short week away on May 7-9. Whether you can’t make it to Seattle or you just want to enhance your on-the-ground experience at the event, Microsoft Build Live brings you live as well as on-demand access to three days of inspiring speakers, spirited discussions, and virtual networking. The livestream gives you another way to connect, spark ideas, and deepen your engagement with the latest ideas in the cloud, AI, mixed reality, and more. How Azure Security Center helps detect attacks against your Linux machines - Azure Security Center (ASC) is now extending its Linux threat detection preview program, both on cloud and on-premise. New capabilities include detection of suspicious processes, suspect login attempts, and anomalous kernel module loads. Security Center is using auditd for collecting machines’ events, which is one of the most common frameworks for auditing on Linux. Any Linux machine that runs auditd by default and is covered by Security Center will benefit from this public preview. This post will also walk you through an example of detection analytics in action in the form of malicious crypto coin mining. It also includes some tips on using Azure Log Analytics with Linux machines. Per disk metrics for Managed & Unmanaged Disks now in public preview - The public preview of per disk metrics for all Managed & Unmanaged Disks enables you to closely monitor and make the right disk selection to suit your application usage pattern. You can also use it to create alerts, diagnosis, and build automation. With this release, it is easier to drill down to a specific disk and figure out the performance characteristics of your workload. Additionally, because of Azure Monitor integration with Grafana, it’s very easy to build a Grafana dashboard with these metrics. Azure Container Instances now generally available - Azure Container Instances (ACI) is a serverless way to run both Linux and Windows containers, and is now generally available. ACI offers you an on-demand compute service delivering rapid deployment of containers with no VM management and automatic, elastic scale. We also announced new lower pricing, making it even less expensive to deploy a single container in the cloud. ACI continues to be the fastest cloud-native option for customers in the cloud, getting you compute in mere seconds that also provide rich features like interactive terminals within running containers and an integrated Azure portal experience. Azure Container Instances GA: A new compute primitive - Justin Luk joins Scott Hanselman to discuss how Azure Container Instances provide a new compute primitive in the form of on-demand containers. ACI provides efficient, granular compute that starts in seconds with simple packaging and no VM management. Discover use cases and ways to leverage ACI in new and existing infrastructure in this episode! Replicated Tables now generally available in Azure SQL Data Warehouse - Replicated Tables, a new type of table distribution, are now generally available in Azure SQL Data Warehouse (SQL DW). SQL DW is a fully managed, flexible, and secure cloud data warehouse tuned for running complex queries fast and across petabytes of data. With Replicated Tables, data is available on all compute nodes, hence data movement is eliminated, and queries run faster. During the public preview of Replicated Tables, SQL Data Warehouse customers saw up to 5x performance gains while transforming data with Replicated Tables when compared to using Round Robin distribution. 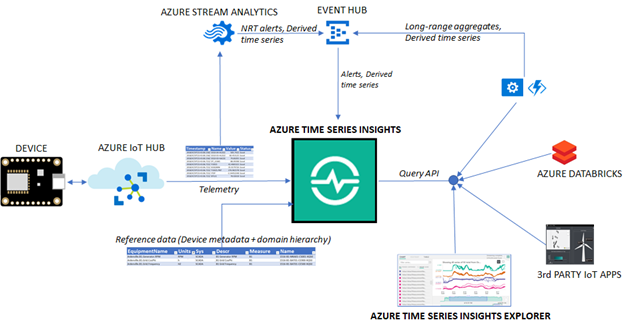 Propel your IoT platform to the cloud with Azure Time Series Insights! - Time Series Insights is evolving from a short-term asset monitoring and diagnostics service to a modern cloud IoT platform for customers and partners to build highly-capable and scalable IoT solutions. Later this year, Azure Time Series Insights will deliver two new capabilities: a cost-effective long-term storage that enables a cloud-based solution to trend years’ worth of time series data pivoted on devices/tags; and a device-based (also known as “tag-based”) user experience backed by a time series model to contextualize raw time series data with device metadata and domain hierarchies. Additionally, Time Series Insights will be integrating with advanced machine learning and analytics tools like Spark and Jupyter notebooks to help customers tackle time series data challenges in new ways. Azure Analysis Services integration with VNets via On-Premises Data Gateway - Azure Analysis Services now provides integration with cloud data sources residing on Azure Virtual Networks (VNets). Organizations use VNets for enhanced security and isolation. Cloud data sources such as Azure SQL DW and Azure Database can be secured with VNet endpoints. What’s brewing in Visual Studio Team Services: April 2018 Digest - Get an overview of the latest updates to Visual Studio Team Services, which offers the best DevOps tooling to create an efficient continuous integration and release pipeline to Azure. With the rapidly expanding list of features in Team Services, teams can start to leverage it more efficiently for all areas of their Azure workflow, for apps written in any language and deployed to any OS. Bing Custom Search: Build a customized search experience in minutes - You can use the Bing Custom Search offering for either powering your site search or building the vertical search experience through multiple relevant domains. Bing Custom Search is an easy-to-use, ad-free search solution that enables users to build a search experience and query content on their specific site, or across a hand-picked set of websites or domains. Read the full blog post at, Bing Custom Search: Build a Customized Site Search in Just a Few Minutes. Azure #CosmosDB: Secure, private, compliant - A database that holds sensitive data across international borders must meet high standards for security, privacy, and compliance. Azure Cosmos DB is a multi-tenant hyper scale cloud platform that is available in all the Azure regions, more than 50 regions worldwide, so customers can specify the region(s) where their data should be located. To help customers meet their own compliance obligations across regulated industries and markets worldwide, Azure maintains the largest compliance portfolio in the industry both in terms of breadth (total number of offerings), as well as depth (number of customer-facing services in assessment scope). Seee this post for the full list of certificates for Azure Cosmos DB as of April, 2018. HDInsight tools for VS Code now supports argparse and Spark 2.2 - HDInsight Tools for VSCode now supports argparse and accepts parameter based Pyspark Job submission. We also enabled the tools to support Spark 2.2 for PySpark author and job submission. The argparse feature grants you great flexibility for your PySpark code author, test and job submission for both batch and interactive query. OS Disk Swap for Managed Virtual Machines now available - The OS Disk Swap capability, which was previously only available for Unmanaged Disks, is now available for VMs using Managed Disks. OS Disk Swap makes it easy to restore a previous backup of the OS Disk or swap out the OS Disk for VM troubleshooting without having to delete the VM. Get the Azure Quick Start Guide for .NET Developers - If you’re a .NET developer, there's a new, free resource that can help you learn about Azure: The Azure Quick Start Guide for .NET Developers. This guide shows .NET developers how they can start with Azure and get the most out of it. The e-book is also great for .NET developers who already use Azure and want to learn more about which Azure services are available to them, and the tools they can use to develop applications for the platform. Get started with Azure for .NET developers - Azure MVP Barry Luijbregts stops by to chat with Scott Hanselman about how .NET developers can easily get started with Azure. They talk about the free e-book: Getting started with Azure for .NET developers and they discuss and show some of the awesome tools that can help you get started with Azure today. Azure IoT Hub SDK officially provides native iOS support - Whether your iOS project is written in Swift or Objective-C, you can now leverage our Azure IoT Hub C SDK and service directly and begin turning your iOS device into an IoT device. Libraries are available on CocoaPod, a popular package manager for iOS, and the source code is available on GitHub. The Azure IoT Hub C SDK is written in C99 for maximum portability to various platforms. The porting process involves writing a thin adoption layer for the platform-specific components, and you can find code for it on GitHub. Storage scenarios for Cray in Azure - When you get a dedicated Cray supercomputer on your Azure virtual network, you also get attached Cray® ClusterStor™ storage. This is a great solution for the high-performance storage you need while running jobs on the supercomputer. When the jobs are done, Azure has a broad portfolio of storage products and solutions, such as Azure Blog Storage, Azure Archive storage, Azure Data Box, and more. No matter what kind of storage you need around your Cray supercomputer, Azure has a product that works for you. The edge of possibility: best practices for IoT-driven infrastructure transformation - A recent Forrester report titled “Edge Computing: IoT Will Spawn A New Infrastructure Market” highlights many of the changes and challenges that must be faced in the rapid evolution required by IoT solutions of IT networks. This post takes a look at a few of the highlights and includes a link to the full Forrester report. Azure Toolkit for IntelliJ integrates with HDInsight Ambari and supports Spark 2.2 - To provide more authentication options, Azure Toolkit for IntelliJ now supports integration with HDInsight clusters through Ambari for job submission, cluster resource browse and storage files navigate. With this release, you can benefit the new functionalities and consume the new libraries & APIs from Spark 2.2 in Azure Toolkit for IntelliJ. Azure Toolkit for Eclipse integrates with HDInsight Ambari and supports Spark 2.2 - To provide more authentication options, Azure Toolkit for Eclipse now supports integration with HDInsight clusters through Ambari for job submission, cluster resource browse and storage files navigate. With this release, you can benefit the new functionalities and consume the new libraries & APIs from Spark 2.2 in Azure Toolkit for Eclipse. Accelerate real-time big data analytics with Spark connector for Microsoft SQL Databases - Apache Spark is a unified analytics engine for large-scale data processing. Today, you can use the built-in JDBC connector to connect to Azure SQL Database or SQL Server to read or write data from Spark jobs. The Spark connector for Azure SQL Database and SQL Server enables SQL databases, including Azure SQL Database and SQL Server, to act as input data source or output data sink for Spark jobs. It enables you to utilize real-time transactional data in big data analytics and persist results for adhoc queries or reporting. Read this post to get started moving data between Spark worker nodes and SQL databases. Organizing subscriptions and resource groups within the Enterprise - Learn how Microsoft's Core Services Engineering and Operations teams secure their Azure footprint for their Line of Business applications while still giving developers the freedom to go fast, have visibility into our environment and use the capabilities of Visual Studio Team Services for CI/CD, Release, and much more. Learn how they use the combination of subscriptions, resource groups, and Role Based Access Control to ensure compliance with a set of guidelines. Migrating your apps, data and infrastructure to Azure is easier than ever - Azure gives you a flexible migration path with hybrid consistency across your on-premises assets and the cloud. You don’t have to move everything all at once. Whether your business requires a hybrid state long-term or only during the migration period, Azure is hybrid by design and can support your needs. Get started with Azure migration by visiting the Azure migration center for guidance or for connecting with a migration expert. And to learn more about Azure’s migration capabilities from our Azure engineering leaders Rohan Kumar and Corey Sanders, register for this webcast on May 17, 2018. Train an IoT-equipped drone and compete to win at Microsoft Build - We’re having a drone contest at Build 2018. Participants will compete against fellow conference goers to see whose drone can complete the outdoor search and rescue course designed specifically for Microsoft Build. You’ll get hands-on, end-to-end experience with Microsoft’s intelligent cloud platform, Azure IoT Edge, and be eligible to win a DJI Mavic Air drone. The Azure Podcast: Episode 226 - API Management Best Practices - Thuru Vijayakumar, a Technology Architect at Tiqri and a Microsoft MVP for Azure. He gives us great advice on using API Management for various scenarios and tips and tricks to avoid common mistakes with the service. Hands-on Lab: Application Innovation with Azure SQL DB - Use Azure SQL Database to improve business continuity, database management and availability. Hands-on Lab: SQL Migration using Azure Data Migration Services (DMS) - Reduce the complexity of your SQL DB cloud migration by using the Data Migration Services (DMS) A single, comprehensive service instead of multiple tools. Hands-on Lab: Create a new Azure Database for MySQL and WordPress app - This topic explains how to deploy and manage an Azure Database for MySQL. Hands-on Lab: Developing Apps with Azure Database for PostgreSQL - Use Azure to create a PostgreSQL database instance for a Python app using the Django framework. DevOps for Game Developers with Microsoft Azure - In this Azure theater session from GDC 2018, Abel Wang covers DevOps: any language, any platform. Abel is a Senior Cloud Developer Advocate specializing in DevOps and Azure with a background in application development. Before joining Microsoft, Abel spent seven years as a Process Consultant and a Certified Scrum Master helping customers globally develop solutions using agile practices and Team Foundation Server. Prior to that, Abel founded and sold his own software company. Setup your CI/CD pipeline for Node.js, Python, .NET, Go, Ruby, or Java - in Minutes - VSTS and Azure together enable developers to create a customize a highly sophisticated CI/CD pipeline for the backend of their service, their website, etc. and getting started on Azure with DevOps projects is beyond easy. Lets talk about why developers should care, how to get started and even how the platform extensibility lets you work with many other build system, source repo providers or even other cloud. Virtual Kubelet Introduction - Ria Bhatia joins Scott Hanselman to discuss Virtual Kubelet and Azure's provider, the ACI Connector. The ACI Connector paired with Kubernetes enables you to quickly spin out container instances from an AKS cluster. This is the fastest way to scale a Kubernetes cluster in the cloud. Ingest, prepare, and transform using Azure Databricks and Data Factory - Today's business managers depend heavily on reliable data integration systems that run complex ETL/ELT workflows (extract, transform/load and load/transform data). Gaurav Malhotra joins Scott Hanselman to discuss how you can iteratively build, debug, deploy, and monitor your data integration workflows (including analytics workloads in Azure Databricks) using Azure Data Factory pipelines.